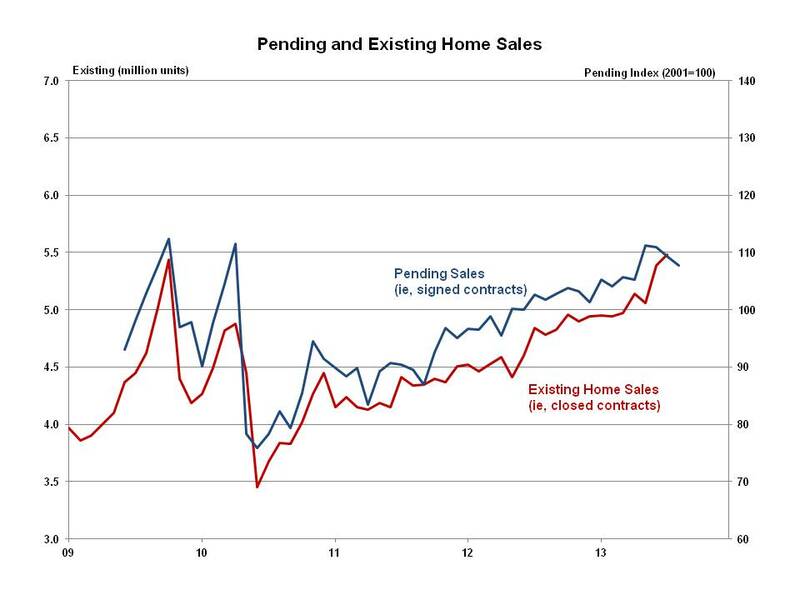 The Pending Home Sales Index (PHSI), a forward-looking indicator based on signed contracts, fell 1.6% in August 2013 to 107.7 from a downwardly revised 109.4 in July. The August 2013 PHSI reported by the National Association of Realtors (NAR) was 5.8% higher than the same period a year ago. The August PHSI increased 4.0% in the Northeast, but fell 1.4%, 3.5% and 1.6 in the Midwest, South and West respectively. Despite the monthly declines, the PHSI increased year-over-year in all four regions: 5.1% in the Northeast, 13.8% in the Midwest, 3.7% in the South and 1.7% in the West. The PHSI has now declined three consecutive months. However, existing home sales reported by NAR a week ago increased 1.7% in August to a seasonally adjusted rate of 5.48 million units following a robust July increase of 6.5%. It is worth noting that existing homes sales are reported on a contracts closed basis, so they reflect market conditions with a longer lag than pending sales. Earlier in the year, the PHSI was a good indicator of what happens to existing home sales when the contracts close in the following of months. These new data suggest flat overall growth in existing home sales for the rest of the year, with month to month volatility as homebuyers adjust to higher mortgage interest rates. Economic and housing data continue to describe a modest recovery for housing that will lead to higher levels of construction activity in the years ahead. While some recent information illustrates that there will be ups and downs along the way, current fundamentals indicate rising demand and insufficient housing inventory.